Today was laundry and grocery day. It was about time to get some spring cleaning done. The fridge definitely needed refilling also. Trader Joe’s is my absolute favorite grocery store ever. 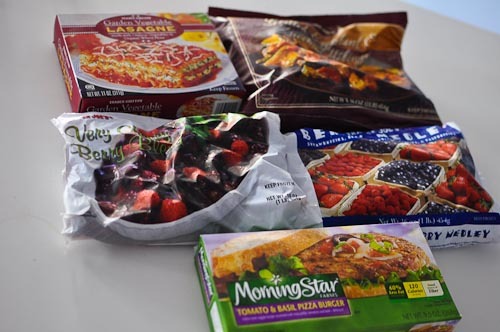 Not only does it have a lot of various healthy and organic products, they are also very affordable. 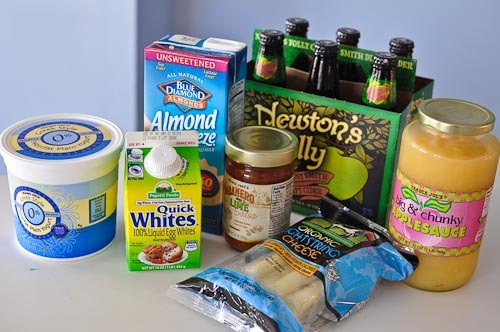 Some of the stuff is cheaper than Jewel or Dominick’s. From left to right: Greek style Nonfat Plain Yogurt (Greek style makes it much higher in protein and lower in sugar than regular nonfat yogurt. I buy plain for its versatility – I use it instead of sour cream or add honey to sweeten it and eat it with fruit), Quick Whites 100% Liquid Egg Whites (I eat this almost every day for breakfast. They are very low calorie and high in protein), Almond Breeze Unsweetened Vanilla (this almond milk is very low in calories and it doesn’t taste bad. Some people say it doesn’t taste like anything, but I’ve gotten used to the taste and enjoy it now. I use it with cereal or in protein shakes), Habanero and Lime salsa (one of my favorite salsas – the lime gives it a kick, which makes it more fun than regular salsa), Newton’s Folly (only my second time trying this, but I’ve been having a hard cider craving lately. Probably because of the beautiful weather), Organic Light String Cheese (I use this for my omelettes – I cut one cheese in half and string it up much like shredded cheese. Doing this allows me to be sure with the exact amount of calories I am consuming from cheese rather than guessing. Also the individually wrapped pieces last longer than if I were to open a shredded cheese bag – I usually don’t have enough time to eat the whole bag before it goes bad. Once you open a bag, it goes bad quickly), Big & Chunky Unsweetened Applesauce (the most delicious appleasauce. It has big apple chunks and I eat it with yogurt and cinnamon). Garden Vegetable Lasagne (I actually haven’t tried this one yet, but it looks good and it’s high in protein), Grilled Eggplant Menage (this one is simply delicious! It has a little bit of cheese in it which makes it feel like a full meal. I don’t eat anything with it. It’s good on its own), Very Cherry Berry Blend (my favorite berry blend because of the cherries. Delicious), Berry Medley (yes, I usually buy two different types of berry medleys to mix it up. I use frozen berries a lot in my yogurt to make it into a healthy yogurt parfait with low sugar cereal or granola), Tomato & Basil Pizza Burger (I don’t eat it very often but sometimes I feel like a quick lower calorie burger, and this one tastes good). 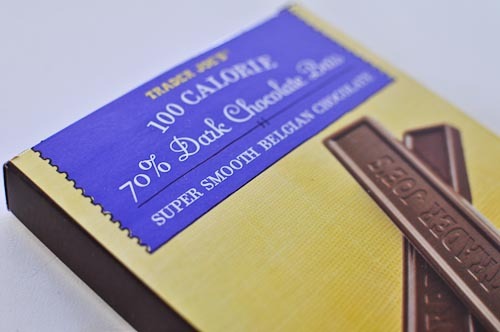 100 calorie 70% dark chocolate bars. This isn’t the only chocolate product I buy, but it happened to be it this time around. I love chocolate, I can’t help it. I love Trader Joe’s. There was one store we used to frequent in the Bay area in California until we moved to Texas. Soon in will branch out in Woondlands Texas. Can’t wait to check it out. You bought a lot of great and interesting buys. Such a a fun and enjoyable post…. I love trader joe’s! I wish there was one closer to me, I have to make a 25 minute run every time I go! Soo worth it though, I’ve never see those 100 calorie chocolate bars, I am now obsessed with them!! I need to find those next time I’m there 🙂 Fun shopping trip!